For many of the expats here, one of the drawbacks of living in Korea is missing out on all of the holiday festivities that take place back home. Those looking for a decent substitute in Korea, especially those living in smaller towns or rural areas, might be disappointed to find that Christmas here is a lot more lowkey than expected. During the holiday season, however, there is a place in Seoul where one can find frenzied shoppers shopping, Christmas jingles jingling, and fancy lights a-sparking. That place would be Myeong-dong. Before even stepping foot in Korea, most people have heard of the Myeong-dong district. It is sure to be featured in in-flight magazines and Seoul travel guides, and for good reason. 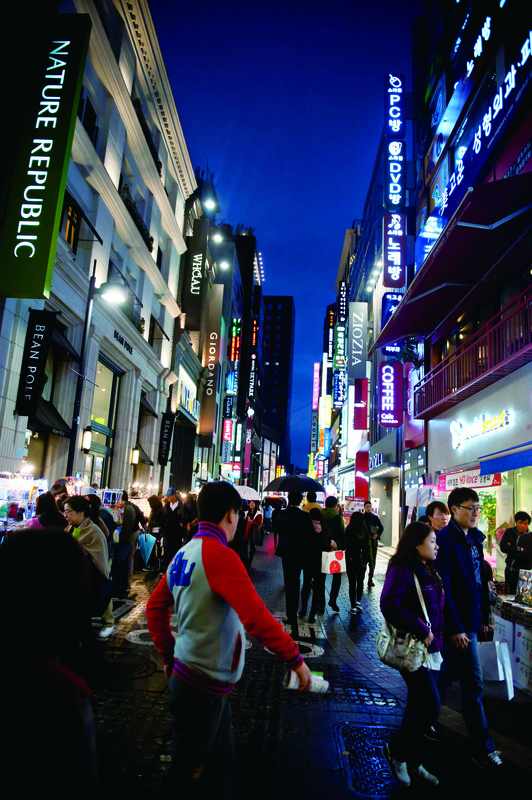 Located in the middle of Seoul, Myeong-dong is often considered to be the center of shopping in Korea. Conveniently situated between N Seoul Tower, Namdaemun Market, and the Cheonggyecheon Stream, it is home to a countless number of stores, cafés, and restaurants, as well as many hotels and hostels; these draw in thousands of tourists daily and make Myeong-dong, quite possibly, the top tourist attraction in Seoul. For locals, Myeong-dong serves as a go-to location for shopping, cafés, meeting points, and hanging out. It is dependable because it has it all, and in abundance. Additionally, when it comes to the holiday season, it is the closest thing to looking a lot like Christmas. Myeong-dong’s streets are laid out more or less in a rectangular grid, and with that concept in mind, it is actually not that difficult to navigate around. The “top” of the Myeong-dong shopping area starts at Myeong-dong Station 명동역 (Line 4) and extends down to Euljiro 1-ga 을지로입구역 (Line 2). The Lotte Department Store, AvenueL, Lotte Young Plaza, and Shinsegae Department Store line the west end, while Myeong-dong Cathedral is located on the east end. 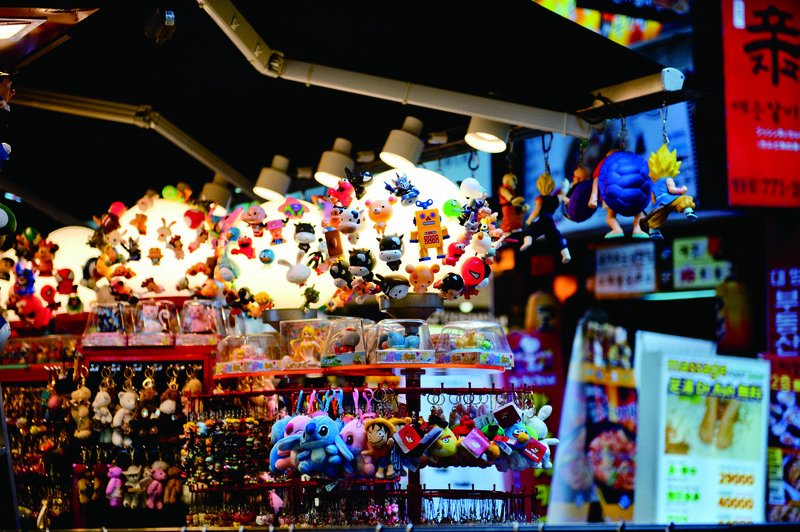 Walking through Myeong-dong can be a bit overwhelming at times, especially on the weekends, but the swarming crowds add to the atmosphere that is signature Myeong-dong. During November and December, one can expect to encounter tables full of accessories; food vendors grilling up hot treats like sausages, meat skewers, and fish cakes; scantily dressed storefront models promoting cosmetics in multiple languages; familiar Christmas tunes playing from within the shops; and even the good ol’ Salvation Army bell. Myeong-dong is bright, very bright. Every store, restaurant, café, and hair salon is lit up by brilliant neon signs that, together with their luminous storefront entrances, illuminate every significant street and alley of Myeong-dong. During the holidays, trees can be found wrapped with string lights in a dazzling fashion, and many establishments have eye-catching holiday-themed decorations on display. If the main Myeong-dong grid gets to be too overwhelming, head to the west end of the district and take a stroll down the main road from Shinsegae Department Store to the Christmas tree at the Lotte Hotel, located in front of Euljiro 1-ga Station, Exits 7 and 8. Along this path, the department stores are impressively decorated with Christmas lights, and the trees along the way are adorned as well. With a hot beverage and a special companion, it is a great way to take a break from the busy center. Ah yes, the shopping and the gifts. What would the holidays be without it? Almost every holiday movie seems to begin with a montage of scenes that involve malls, gifts, fighting over items, and plenty of shopping bags. Even the days after Thanksgiving and Christmas could be considered holidays in and of themselves. Not only are brand stores available here, many of them are much larger than what you might find in other malls, so fighting other shoppers over that last gift item is a lot less likely to happen. The enormous Uniqlo right outside of Myeong-dong Station, for example, just happens to be one of their global flagship stores. Have a taste for highend? Head to Shinsegae’s main branch (which was also Korea’s very first department store) or to Lotte Department Store’s AvenueL branch for brands like Hermes, Louis Vuitton, or Tiffany & Co.
(T. 02-776-5348, [ Map 4 C3] ): Having been in business for over 40 years, this restaurant is a Myeong-dong landmark; their kalguksu (handmade knife-cut noodles) is a must. 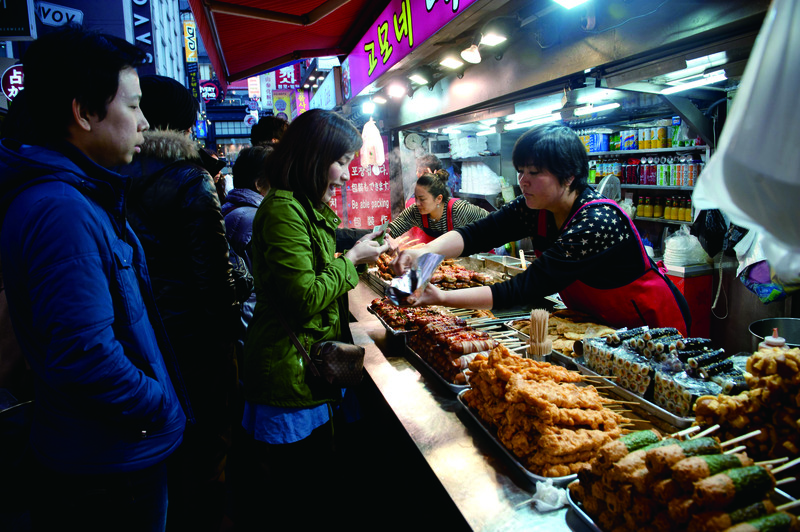 Myeong-dong offers a wide variety of street food, such as gimbap, meat and fishcake skewers, bacon-wrapped sausages, and roasted chestnuts. (T. 02-3789-7801, [ Map 4 C2] ): Located near Euljiro 1-ga Station next to KEB, this café offers a getaway from the big crowds. The café has a spacious terrace and an even bigger interior. Try one of their seasonal lattes or teas, along with their baked goods. (T. 02-318-0760, [ Map 4 C2] ): Gong Cha is a chain from Taiwan specializing in Taiwanese teas. Their house specials are their milk tea beverages, which feature tea on the bottom and a creamy foam on top. (T. 02-777-4986, [ Map 4 B1] ): A large two-story bar that serves a wide selection of beverages. They have an impressive list of draft beers, as well as an ice bar in the corner. Ordering food is not required, but the seafood platter is excellent. 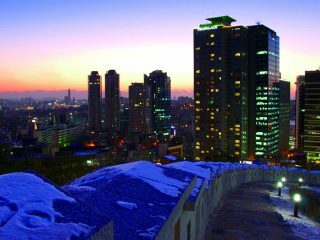 Most of the bars are located on the northern half of the Myeong-dong grid, closer to Euljiro 1-gaStation. Here you can find traditional hofs as well as barbecue seafood and meat joints, where people go to both drink and satisfy their case of the munchies. station, pick up a scarf at one of the accessory tables, then go down a few more tables to pick up matching gloves. You might find beanies and winter hats as well. 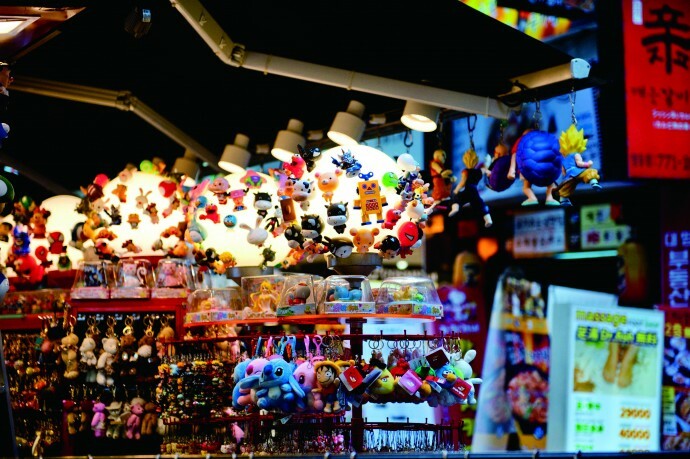 Check out the wide variety of keychains and phone charms to send back home as gifts. You can find miniature soju bottles, imitation dinner rolls, and animation characters.